The Young and the Restless Spoilers: Mia’s Super Stressed – Fight With Sharon Causes Miscarriage? Brace yourself Hunger Game fans a new trailer has been released. According to Lionsgate, it “will mark the first time ever that audiences will be exposed to sights and sounds from the film such as Katniss’ home District 12 and the opulent Capitol.” Can I just say – without stating the obvious – that this movie franchise is going to be HUGE. Huge like Twilight, huge like Harry Potter. The trailer looks fantastic, and it was about time that we got to see more! The trailer opens with Jennifer Lawrence’s Katniss (our main heroine) and her friend (and potential lover boy) Liam Hemswoth’s character Gale hunting in the woods. It cuts to the reaping, where in the post-apocalyptic society children are forced into a lottery where they are chosen to fight in the annual Hunger Games, a fight-to the death comptetiton. Honestly, the trailer gave me chills!! It gave us just enough to nearly jump off the edge of our seats, without revealing too much. I love how the trailer ends with the tributes entering the arena – so much more to look forward to! Um…ya, I second that Josh. It opens March 23, 2012…just not soon enough! Jennifer Lawrence as Katniss – First Look! 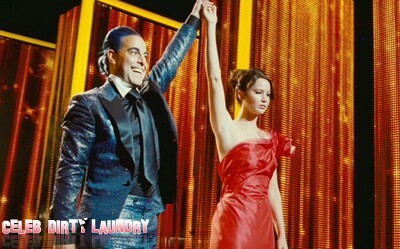 The Hunger Games Trailer To Air During MTV Awards! Footloose Gets A Remake – Will It Be As Good As The Original?